Be prepared for a grand adventure and, really, it’s quite a ride. I loved The Earl from moment of the hero and heroine's first glimpse of one another at the end of The Rogue. Katherine Ashe has done it once again. The Earl holds a unique place in her booklist. It is the last book in her amazing Falcon Club series. (Go and glom her list for them.) It is also the second book in her latest series. 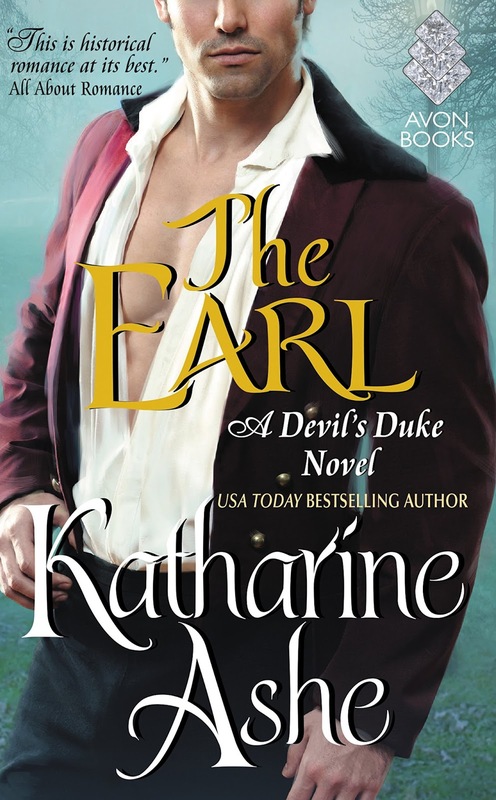 Even so, I would venture to say you could read The Earl as a stand alone without a problem. In The Earl, the identities of the final member of the Falcon Club, Peregrine and Lady Justice are finally revealed to both the reader and, more importantly, to one another. What is delicious is that one of them doesn’t know who the other is until much later in the book. What we also come to learn is that Peregrine and Lady Justice or Colin, Lord Egremoor and Lady Emily aka Zanobia have a history. What draws them together beyond their hidden identities is a common quest. Lady Emily’s sister and her friend have gone missing. Lady Justice enlists Peregrine’s aid in finding her. After she discovers his identity, she decides to go out on her own to find her but this is Peregrine’s last mission and he would see it to its end. It’s what he does. Find people. And so they make their way to Scotland to a wicked Duke’s home where rumors of missing maidens abound. They happen upon one another at an inn where the owners and drunken patrons take a particular interest in just who the Earl and the lady are. Angry villagers seem to be hot on their trail for crimes committed in the earl’s name. And so Emily and Colin are thrown together and have to make their way through fields and forest and farms. No one to trust but each other and that is a lot to ask. It is on this unexpected journey that they open themselves to face their pain and communicate for the first time while working to find her sister and clear their names. There are surprises at every turn. They have much to learn about themselves, their hidden identities and what shaped them into who they are today. I would highly recommend this book to anyone. Katherine Ashe brings Scotland to life. She brings love to two people who, in the end, bare their souls to one another and to the world. Love is the grand adventure to this couple’s happily ever after. Katharine's books never fail to please me. I've put this on my "must read" list. Thanks, Santa! 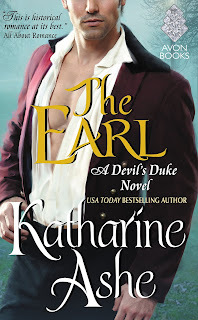 I enjoy Katharine Ashe's books and am eagerly looking forward to reading The Earl, especially after reading your review! I do enjoy her stories - sounds like another great read! Soounds wonderful. I need to catch up with this series.